Four carloads left Petra’s at 7:30 a.m. and along Highway 17 toward the Ferry Port, the juvenile Red-tailed Hawk was posted in his regular hydro tower. There were tonnes of newly-arrived ducks in the Bay at the jetty entrance (north side, low tide); Bryan & Janet stopped there and reported that they were mostly Mallards, Northern Pintail and Green-winged Teal with many Great Blue Herons and a couple of Caspian Terns among them. We (4 cars) pulled off into the construction zone and scanned the Bay for 10 minutes until the nice Construction Foreman threw us out. We saw a few Common Loons, some still in breeding plumage, along with some Black Oystercatchers and a couple of Pelagic Cormorants among the Double-crested. Then we drove to the Port entrance and parked in our usual spot beneath the No Parking sign. We were blanked on Surfbirds, Heermann’s Gull and Black Turnstones, but enjoyed the Harlequin Ducks and a few more Oystercatchers. We left the Port when ferry traffic increased, and didn’t see the Willet either. Hope it comes back for the 10th (?) year. Entering the Tsawwassen First Nations (TFN) lands, we stopped at the Kingfisher Bridge because some idiot thought erroneously that he saw the Kingfisher. Lots of Barn and Tree Swallows around, hawking insects. 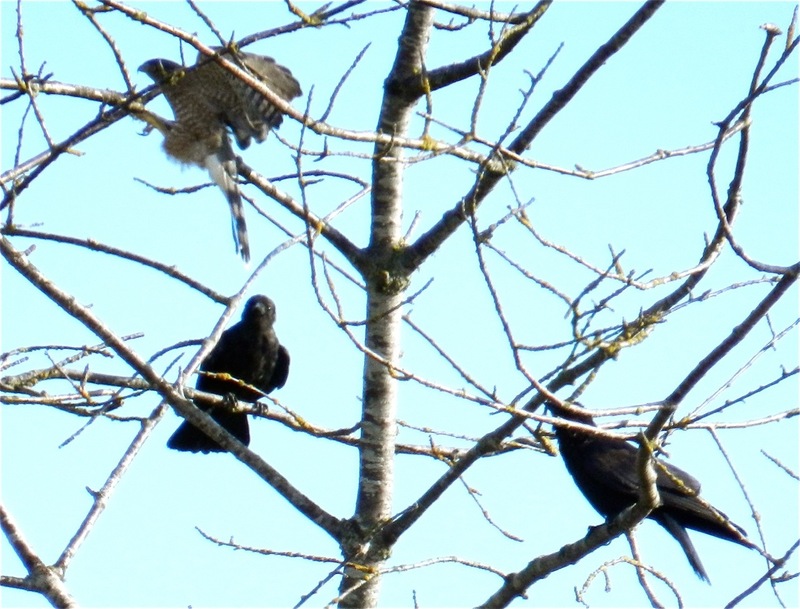 Next stop near the TFN Longhouse was for a juvenile Cooper’s Hawk that we watched jabbing at a couple of Crows; neat bit of action. 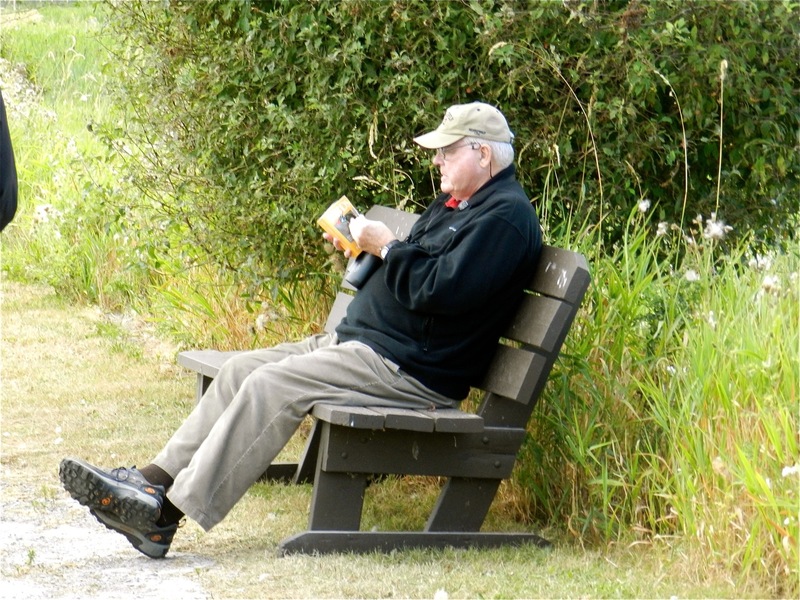 We continued on through the Ladner farm fields to our regular look-out at Canoe Pass on the Fraser River. On the other side of the river, we saw about a dozen Greater White-fronted Geese with a flock of Canada’s. Eurasian Collared-doves were on the telephone lines and we left before two approaching Mute Swans (beggars) got close to us. We crossed the 100 year old Westham Island swing bridge and drove to Reifel, passing the Ellis’ Herb Farm where Delta Nats will have their hands-on Display on Sept. 8 at the Day at the Farm event (this is a PLUG!) In the Reifel parking lot, we ate a few of Terry’s stale nut mixture before checking in with the always-smiling Varri and Laura. No Shorebirds in the dry pond behind the reception centre, but several 2nd or 3rd broods of nesting Barn Swallows were in mud nests around the warming shack. One Black-crowned Night-Heron was in its tree. We took the obligatory Group Photo above the feeding Carp crowd. We walked the east dike trail, feeding Chickadees from our hands along the way. A flurry of activity in a tree caught our attention and with some discussion, we identified Warbling Vireos, Yellow-rumped Warblers, a Yellow Warbler, an Orange-crowned Warbler and American Goldfinches and Spotted Towhees among this mixed flock. We also saw a couple of Brown Creepers. Some saw the GHO near to where they nested a few years back (as Reifel’s Shanna had advised us earlier). Further along, while watching a male Wood Duck approaching breeding plumage, one of the two juvenile resident GHO’s scattered the ducks in the stream and landed on a log beside some now very attentive Mallards. Eyes wide open, it watched us as we photographed him/her. Unusual activity and roost for a GHO in mid day. A Pacific-slope Flycatcher gave some of us a good look before flying off. The invasive Blackberry bushes were laden with ripe fruit, but no one ate any because it’s prohibited at Reifel. A bird told me this was the best Blackberry-eating day he had ever had. Good thing no one checked our purple tongues on exit. At the Tower, this pond was very dry too with only a couple of Lesser Yellowlegs in it. 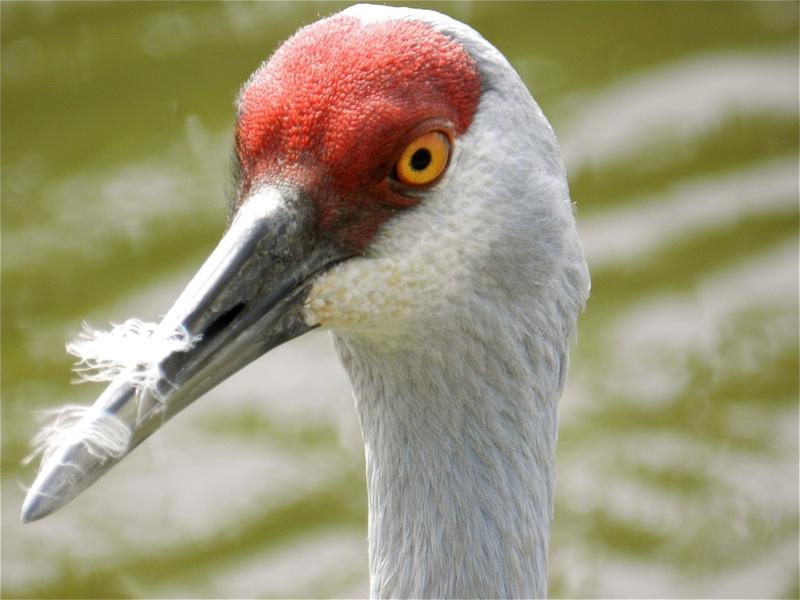 Five Sandhill Cranes flew in, and they enjoyed our stale peanuts, even from my hand. Northern Harriers were gliding over the marsh as were several species of Swallows (Violet-green, Northern Rough-winged, Bank?). A Cedar Waxwing landed in a tree by the Tower where we often see lots of them. We walked the outer dike and more Shorebirds were in the second pond. We saw 5 Stilt Sandpipers (my Bird of the Day). Others in this pond included; two Red-necked Phalaropes, Dowitchers (possibly both Long- and Short-billed), Yellowlegs (both Greater and Lesser), Green-winged Teal, Gadwall, Northern Shovelers, Killdeer. 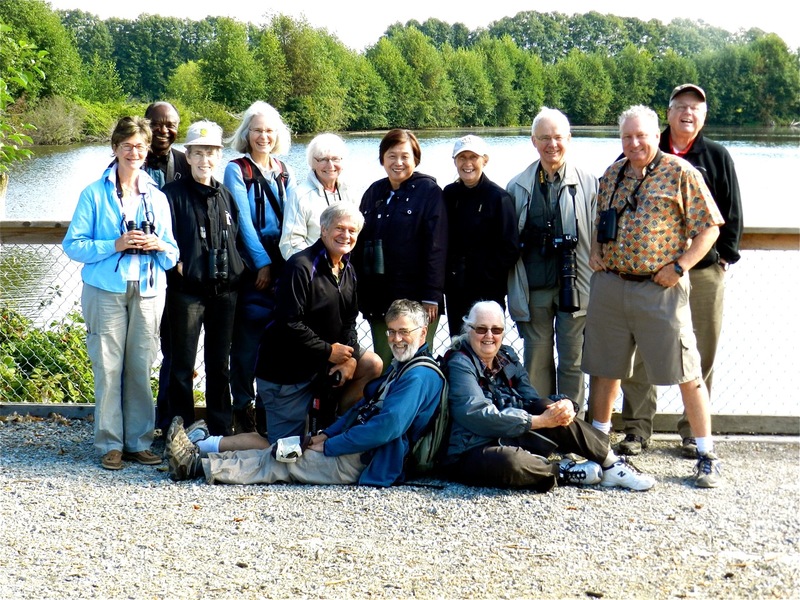 Interestingly, two Peeps on a log resulted in a 7 species sighting by our “expert” birders. The two birds were identified as: Western, Semipalmated and Least Sandpipers, Dunlin, Sanderling, Pectoral and Baird’s Sandpipers. That’s why we’re “casual”. 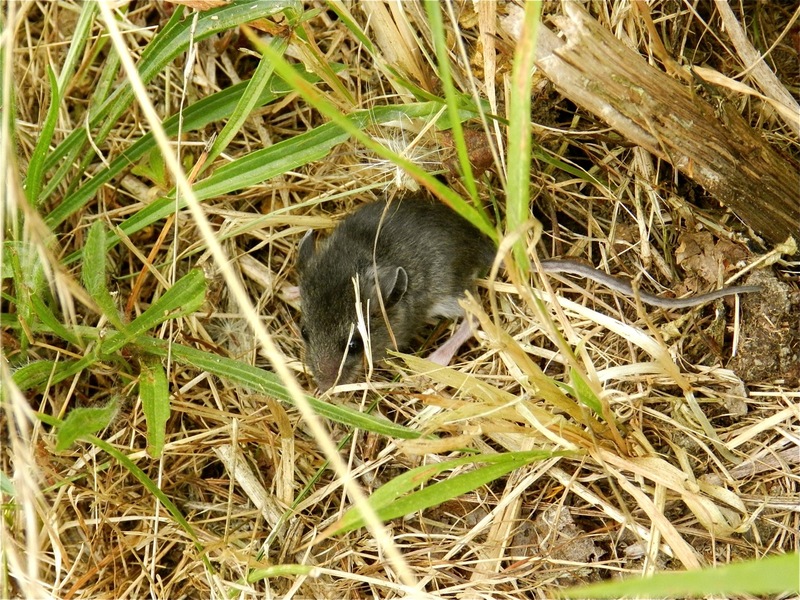 There was also a mouse on the trail. Past Noon, and suspecting that Mike, who was now comatose on bench, was having a hunger attack, we headed back to the entrance. Five Hooded Mergansers were in the slough near the middle Viewing Platform, along with an interesting hybrid Mallard-Shoveler or Pintail. The drive back to Petra’s was uneventful. After dropping off the CB’s, I crossed the Border for some cheap Pt. Robert’s gas and a bottle of Aussie wine and went home to start Sandra’s To Do List. Another super DNCB morning. Next Wednesday, Sept. 5 we will be going to Mt. Baker in the USA, leaving Petra’s at 7:00 a.m. under Terry Carr’s guidance. Bring Passport and a lunch, and let Terry or me know if you plan to join us (for logistics and car-pooling). I apologize (not really) for the length of this drivel; I guess the blackberries caused me to babble more than usual. Comments welcome, and let me know if you want off my List to receive these literary gems. Cheers: Tom (going to Giants’ exhibition game while Sandra hits the Casino). 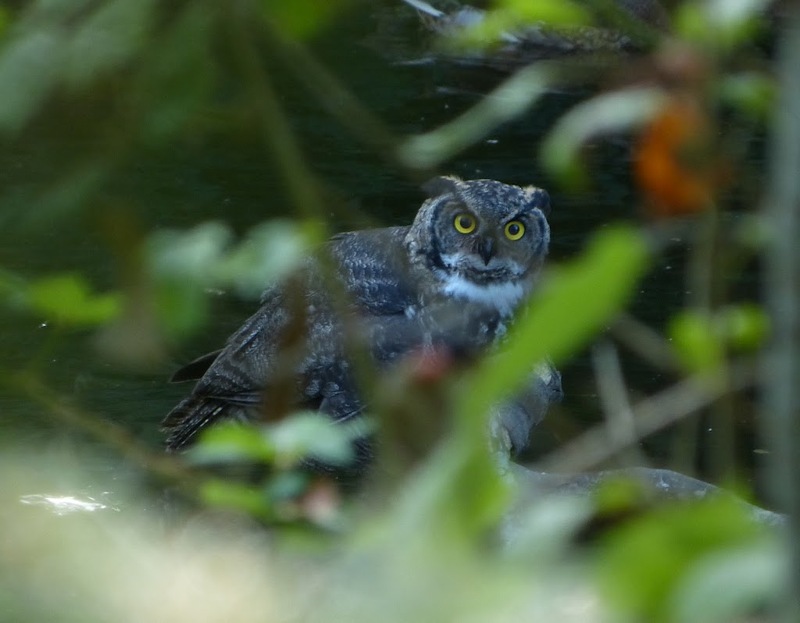 This entry was posted in *DNCB, Cooper's Hawk, Great Horned Owl, Northern Harrier, Reifel, TFN, Tsawwassen Ferry Port. Bookmark the permalink.